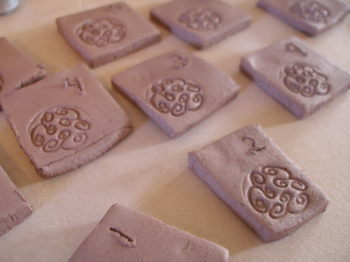 trying out a new clay: riverstone. I love the bit of gritty texture I feel when I work with it. chunky circles: trying out another new idea. 1. How do I clean my mac laptop screen safely? it’s nasty. 2. I’m in the market for an infant carseat. What do you use? Which do you like/dislike? I "handled" a few at Target this afternoon. Whoa, are they heavy–and that’s without a baby in them! My arms are definitely out of carseat slinging shape. I’d rather hear what you all use than spend time browsing through page after page of carseats on the internet….thank you. thank you! I really liked the Graco Safeseat. It holds a kid rearfacing up to 30 lbs so will take a big baby safely (and you never know how big your kid will be until they’re born!! ).Also it has shock-absorbing EPS foam padding around the head reducing risk of head injury in car accidents, making it way safer than all the other infant seats. Big bonus! i used the same graco for all 3 kids – they grew out of it pretty quick, so it’s in amazing shape. i liked it a lot – the only thing i’d say is go for a 5-point harness. yes, heavy and really expensive! when I had Penelope almost 3 years ago, I was astonished at the price! I would get a seat that already has one of those nifty snap on covers- something you will like next Fall and on chilly “air conditioned” days. That was the one invention I loved after having my third. My sister has a Peg Perego and it’s super nice- I use it often (I babysit for her), the one thing I noticed is that it doesn’t fit on all shopping carts. Someone at the store told me that most seats don’t…Ack. When are you due? soon, huh? I’ve gone through a couple, the best (o.k. last/newest) seat I’ve bought is the Graco Platinum ‘CarGo’ Stage II Booster Car Seat which is relatively light and narrow, very important as I have 3 seats in the back of my Hyundai Accent. i had a graco infant seat that i loved – it was easy to tote around and hooked onto shopping carts. my nephew (who is on the small size) outgrew his peg perego one rather fast. and for the real deal, we had two britax roundabouts. pricey, but worth every penny. We went straight for the convertible infant to 40 pound seat, and researched on Consumer Reports for the best safety-wise (you can join for one month to do the research, if you want). My friends all loved Britax… I just carried the boy in the Bjorn in stores, etc., and (maybe because we never had it to begin with) I never wished for the carrier type. The infant carrier types were SO heavy, and he was heavy enough early on. With the cost savings of only buying one (rather than two in the first year like friends had) I felt like we could really invest in the best convertible. I want the answer to the Mac screen too! OK – obviously I was not paying enough attention, for baby I have a ancient Costco, and an Eddie Bauer seat (which I really like) but it does not leave the car so you have to decide if that something you need. I like the sound of that clay – did you did it up from the river yourself? Oh – and we just went to Target and bought the cheapest carseat on sale for our first kid, and then got a Grandma onto the job for the second – mindnummbing stuff! We had an evenflo seat that I liked, but I had hefty boys who were out of it pretty fast. And yes, they are heniously heavy. LOVE the tree also. And green is ahem really nice. And I should have some birthday fun $$ by your next shop update maybe. I use one of those static cling cleaning cloths to clean my computer screen. It gets off the gunk without the need to use a cleaner, which my hubby, the computer guy, says is a no-no. Plus, they rock to dust the whole house and can just be tossed into the washer and dryer to clean. If there is gunk in the keys, try using a can of air. Also, there are special cleaning cloth things for Macs that my hubby says are at the Mac Store. But I would try what I said first, because its cheaper. Here’s another recommedation for the Graco. We have the Snugride for our infant seat. We have small cars, so we wanted a small seat. It is fairly light (they’re all pretty heavy with a baby in them though). It is a bargain AND safe — two things that don’t always go together. My laptop screen needs a clean, too. Elise was trying to put stickers on it the other day. I used a Britax car seat which I liked but this was back in the day when there were only a couple of options and they all seemed much of a muchness. The car seat, we used a graco with both babies but ours grew out of them pretty quick (watch the weight AND height limits – my two got too tall at 4 months). After they outgrew the carrier we switched to a Britax convertible. For the screen you can buy screen cleaner. I recommend the pre-moistened wipes. I think you can get them most anywhere. 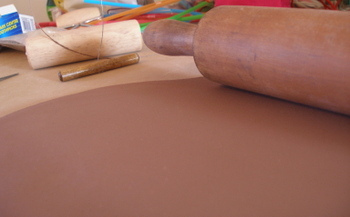 Can’t wait to see the clay after the kiln! i can’t even vote. i hate infant carriers. I do recommend those frame stroller things that are super light that you just click them into though. saves your arms and i think safter. also make sure you check the recent recall lists and crash tests before you buy. you wouldn’t believe how many fail tests. consumer reports is a good place to start. We didn’t use the baby bucket type car seat and went straight to the convertible. We use a variety of slings to carry our babies around in. for the life of me i can’t think of the name of our carseat..maybe it’s because sammi has been sick and we haven’t used it in forever! and i am interested to find out how to clean the screen too! mine could use a good spring cleaning!! Oh, I like the new exploration ideas. The imprints on your pendants look promising. Have fun. OoHH! Molly I can’t wait to see how these all turn out. I know they will be great. It seems you stuff just keeps getting better and better, seriously.Baby seats, I had the best luck with the ones that have the level on the side. It lets you know if the seat is positions correctly. No car seat experience here. 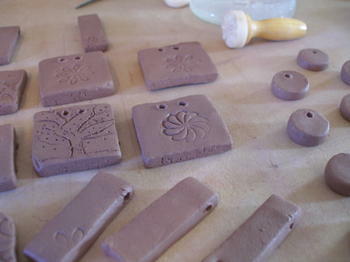 The pendants etc look great, can’t wait to see the finished product. wow. 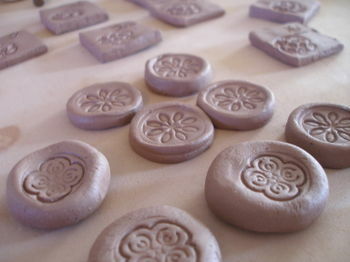 those stamped circles are beautiful.i wish i could touch them they seem so tactile.whatever the glaze i bet they will look amazingwhen finished. looks like a fun afternoon. Didn’t need the car seat info – ours is still going for Lilybelle but I was interested to read about cleaning the screen – 3 children – ours is manky! I’m totally in love with the vertical rectangle shape and adding the tree would definitely be the one I’m purchasing if you put that up in the shop…you know I LOVE trees! I have always used Graco infant seats and love them greatly except for the one with the handle turned sideways right at the center of the handle. I don’t carry my carseats that way so it’s uncomfortable for me to use those. My daycare mom switched out the carseat she gave me for her son so I could use the other kind I like instead. He seems to sit better in that seat as well. To clean my laptop screen I use a slightly dried out Windex all purpose wipe, if it’s too wet than it leaves streaks so I let it air dry just a little. We’ve used the Graco Snugride. Both of my girls outgrew it lengthwise well before hitting the 20 lbs weight limit. We liked how it felt to carry it, and it snapped into our Combi stroller. With baby number two, we bought the Graco double stroller that the infant seat fit into. It also seemed reasonable and well-rated by Consumer Reports (at least in 2000). I’d go with Graco, too. I used it and the stroller for both my kids and loved how I could carry them around or put them in the shopping cart. Also, for when the baby gets older, I might suggest a Britax. Both my kids (ages 2 1/2 and 1 1/2) are in them now and I love them. I feel that they are very safe in these car seats. Oh, and Britax gets wonderful ratings from Consumer Reports and other places. It is the online counterpart to the Baby Bargains book which saved my sanity. For what it’s worth, I’m going with the Chicco KeyFit. It comes highly recommended. (and p.s., don’t bother with the Consumer Reports testing from this year on infant seats as they have already retracted the findings). i love my britax. I got it for my daughter and it’s so soft and cushy. a lot of the others are just so hard. anyway my daughter loves it. my son has been in the costco alpha omega and that’s worked out well for us too. i think if you just take the time to get it installed properly and do a little research you should be in good shape.